Although peanut butter, milk and fruits are common sources of food allergies, it also is possible to be allergic to other food components and additives. This includes nitrates, which are compounds that occur when nitrogen is broken down. Nitrates are converted into nitrites when certain bacteria -- including botulism toxin -- are present. If you suspect you may be experiencing a food allergy, knowing allergy symptoms and foods that contain nitrites can help you and your physician determine if you have an allergy. A food allergy occurs when your body perceives a substance such as nitrates or nitrites as foreign substances. Your body responds by making antibodies, which are substances that typically fight off bacteria or viruses in your body. While antibodies normally are a positive response, in the case of foods that aren't harmful, you can experience symptoms like voice hoarseness, throat tightness, wheezing, cough, nausea, vomiting, stomach pain and diarrhea. In cases of a severe allergic reaction, you can experience anaphylaxis that affects your breathing and blood pressure. Over time, botulism bacteria develop on meats. As a means to reduce the development of bacteria, the curing process was created. This involves adding sodium nitrates, which are changed to nitrite in the storage process, to enhance food preservation. This helps to give meats taste and extends their shelf lives. The U.S. Food & Drug Administration has recognized nitrates as "generally recognized as safe" as a food additive. This does not, however, mean your body may not have an allergic reaction to nitrate consumption. Also, nitrates are present in soil, meaning some vegetables that grow in the ground can contain nitrates as well. If you think you may have a nitrate allergy, you should avoid foods that contain nitrates. This includes cured meats like ham, hot dogs and bacon. Vegetables contain nitrates as well, including spinach, beets, radishes, celery and cabbage. Whenever possible, avoid these foods. 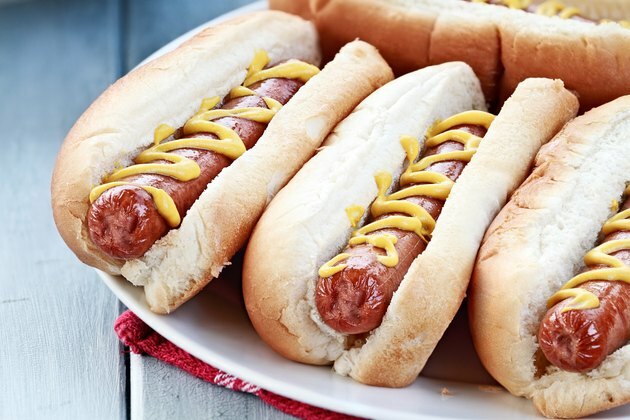 You also can look for foods like hams and hots dogs labeled "uncured," "no nitrites" or "no nitrites added." Even if you do not typically have an allergic reaction to nitrates, you may find you experience an increased sensitivity when pregnant. This is because your blood contains more methehemoglobin, which is more sensitive to nitrates. You may notice an increased reaction after roughly the 30th week into your pregnancy. During this time, you may wish to avoid nitrates to prevent upset stomach. Can You Eat Sulfites When Pregnant?